A stem duchy (German: Stammesherzogtümer, from stamm, meaning "tribe", in reference to the Germanic tribes of the Franks, Saxons, Bavarians and Swabians) was a constituent duchy of the kingdom of Germany at the time of the extinction of the Carolingian dynasty (the death of Louis the Child in 911) and the transitional period leading to the formation of the Holy Roman Empire later in the 10th century. The Carolingians had dissolved the original tribal duchies of the Frankish Empire in the 8th century. As the Carolingian Empire declined in the late 9th century, the old tribal areas assumed new identities as the subdivisions of the realm. These are the five stem duchies (sometimes also called "younger stem duchies" in reference to the pre-Carolingian tribal duchies): Bavaria, Franconia, Lotharingia, Saxony and Swabia (Alemannia). The stem duchies were retained as the major divisions of Germany under the Salian dynasty, but they became increasingly obsolete during the early high medieval period under the Hohenstaufen, and they were finally abolished in 1180 by Frederick Barbarossa in favour of more numerous territorial duchies. The term Stammesherzogtum as used in German historiography dates to the mid-19th century, and from the beginning was closely related to the question of national unification. The term's applicability, and the nature of the stem duchies in medieval Germany consequently have a long history of controversy. The overly literal or etymologizing English translation "stem duchy" was coined in the early 20th century. While later authors tend to clarify the term by using the alternative translation "tribal", use of the term "stem duchies" has become conventional. Linguistic map of Old High German (Alemannic and Bavarian), Old Frankish, Old Saxon and Old Frisian at the time of Otto I, 10th century. The derivation of the German people from a number of German tribes (Deutsche Stämme; Volksstämme) developed in 18th to 19th century German historiography and ethnography. This concept of German "stems" relates to the early and high medieval period and is to be distinguished from the more generic Germanic tribes of Late Antiquity. A distinction was sometimes made between the "ancient stems" (Altstämme), which were in existence in the 10th century, and "recent stems" (Neustämme), which emerged in the high medieval period as a result of eastward expansion. The delineation of the two concepts is necessarily vague, and as a result the concept has a history of political and academic dispute. The terms Stamm, Nation or Volk variously used in modern German historiography reflect the Middle Latin gens, natio or populus of the medieval source material. Traditional German historiography counts six Altstämme or "ancient stems", viz. Bavarians, Swabians (Alamanni), Franks, Saxons, Frisians and Thuringians. All of these were incorporated in the Carolingian Empire by the late 8th century. Only four of them are represented in the later stem duchies; the former Merovingian duchy of Thuringia was absorbed into Saxony in 908 while the former Frisian kingdom had been conquered into Francia already in 734. The customary or tribal laws of these groups were recorded in the early medieval period (Lex Baiuvariorum, Lex Alamannorum, Lex Salica and Lex Ripuaria, Lex Saxonum, Lex Frisonum and Lex Thuringorum). Franconian, Saxon and Swabian law remained in force and competed with imperial law well into the 13th century. The list of "recent stems" or Neustämme, is much less definite and subject to considerable variation; groups that have been listed under this heading include the Märker, Lausitzer, Mecklenburger, Upper Saxons, Pomeranians, Silesians, and East Prussians, roughly reflecting German settlement activity during the 12th to 15th centuries. The use of Stämme, "tribes", rather than Völker "nations, peoples", emerged in the early 19th century in the context of the project of German unification. Karl Friedrich Eichhorn in 1808 still used Deutsche Völker "German nations". Friedrich Christoph Dahlmann in 1815 asked for unity of the German nation (Volk) in its tribes (in seinen Stämmen). This terminology became standard and is reflected in the preamble of the Weimar constitution of 1919, reading Das deutsche Volk, einig in seinen Stämmen [...] "The German nation (people), united in its tribes (stems) ...". The composition of the German population of these stems or tribes as a historical reality is mostly recognized in contemporary historiography, while the caveat is frequently made that each of them should be treated as an individual case with a different history of ethnogenesis, although some historians have revived the terminology of "peoples" (Völker) rather than "tribes" (Stämme). The division remains in current use in the conventional classification of German dialects into Franconian, Alemannic, Thuringian, Bavarian and Low Saxon (including Friso-Saxon, with Frisian proper being regarded as a separate language). In the Free State of Bavaria, the division into "Bavarian stems" (bayerische Stämme) remains current for the populations of Altbayern (Bavaria proper), Franconia and Swabia. I am attempting to refute the whole hallowed doctrine of the difference between the beginnings of the West-Frankish, "French", principautés territoriales, and the East-Frankish, "German," stem-duchies. . . Certainly, their names had already appeared during the Migrations. Yet, their political institutional, and biological structures had more often than not thoroughly changed. I have, moreover, refuted the basic difference between the so-called älteres Stammesfürstentum [older tribal principalities] and jüngeres Stammesfürstentum [newer tribal principalities], since I consider the duchies before and after Charlemagne to have been basically the same Frankish institution. 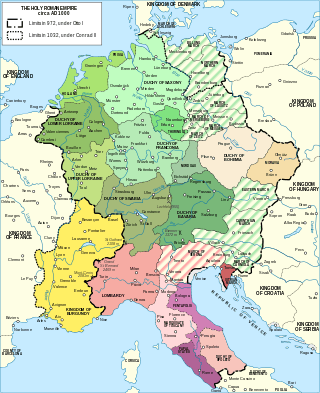 . .
After the division of the Kingdom in the Treaties of Verdun (843), Meerssen (870), and Ribemont (880), the Eastern Frankish Kingdom or East Francia was formed out of Bavaria, Alemannia, and Saxony together with eastern parts of the Frankish territory. The kingdom was divided in 864–865 among the sons of Louis the German, largely along the lines of the tribes. Royal power quickly disintegrated after 899 under the rule of Louis the Child, which allowed local magnates to revive the duchies as autonomous entities and rule their tribes under the supreme authority of the King. After the death of the last Carolingian, Louis the Child, in 911, the stem duchies acknowledged the unity of the kingdom. The dukes gathered and elected Conrad I to be their king. According to Tellenbach's thesis, the dukes created the duchies during Conrad's reign. No duke attempted to set up an independent kingdom. Even after the death of Conrad in 918, when the election of Henry the Fowler was disputed, his rival, Arnulf, Duke of Bavaria, did not establish a separate kingdom but claimed the whole, before being forced by Henry to submit to royal authority. Henry may even have promulgated a law stipulating that the kingdom would thereafter be united. Arnulf continued to rule it like a king even after his submission, but after his death in 937 it was quickly brought under royal control by Henry's son Otto the Great. The Ottonians worked to preserve the duchies as offices of the crown, but by the reign of Henry IV the dukes had made them functionally hereditary. The Conradine family, close to the royal court, obtained ducal hegemony in Franconia but never managed to unify the region. Franconia did not encompass the entire tribal territory of the Franks, which became known as Austrasia, and which was split into three parts in the Treaty of Verdun of 843, the other two parts becoming Lotharingia and the core of the kingdom of France, respectively. After attaining the Kingship in 911, the Conradines had to yield the crown to the Saxon Liudolfings. After a failed rebellion, the Conradines were deposed and the Duchy made into a land of the crown. The region fragmented into a conglomerate of noble territories and ecclesiastical principalities as early as 939 and was never restored as a political entity or administrative division. Neither did Franconia retain its cultural or linguistic identity; the Franconian dialects are now arrayed along the dialect continuum known as the "Rhenish fan", split into High Franconian, Central Franconian and Low Franconian branches and their sub-dialects. As a central component of the Frankish kingdom and with an essentially Frankish tribal identity, Lotharingia was split off Austrasia as part of Middle Francia in 843, and organized as a Duchy in 903. It kept changing position between the Eastern and the Western Kingdom until 939, when it was firmly incorporated into the Eastern Kingdom. In 959 the Duchy was divided into Lower Lotharingia (which in turn fragmented further into the counties and duchies of the Netherlands (present day Belgium, the Netherlands, and Luxembourg) only to be reunited by the Dukes of Burgundy) and Upper Lotharingia (parts of which developed into the French territory called Lorraine). Lower Lorraine remained a duchy of the Holy Roman Empire until 1190, when it passed to the Dukes of Brabant. Alemannia had been nominally associated with the Frankish kingdom since the end of the 5th century, but it became a duchy under direct Frankish control only in 746. The names Alemannia and Swabia were used more or less interchangeably during the high medieval period. The Thurgau-based Hunfridings first rose to the position of Dukes but soon lost the rule in their struggle with the Liudolfing kings. After various families, the Duchy passed to the Hohenstaufen family in 1079. Their rise to the Kingship made Swabia a royal base, but their fall in the 13th century left Swabia in complete disarray, with remains falling to the Wittelsbach, Württemberg, and Habsburg families, the latter soon after facing the secession of the Old Swiss Confederacy. 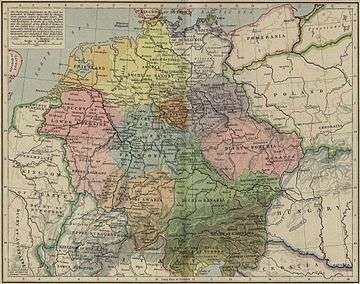 The core territory of Swabia continued its existence as the County of Württemberg, raised to the status of Duchy in 1495, which in turn became the Kingdom of Württemberg within 19th-century Germany. The Liudolfing family, which had long been employed in the administration of Saxony, rose to the position of Dukes and even Kings after 919. In the 11th century, the Duchy was ruled by the Billungs. After 1137 the House of Welf dominated the duchy. The fall of Duke Henry the Lion in 1180 resulted in the dismantling of the stem duchy, splitting off the Duchy of Westphalia and the Duchy of Brunswick-Lüneburg, leaving a core Duchy of Saxony on the river Elbe, enfeoffed to the Ascanians. 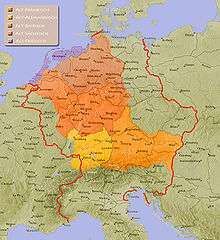 This remainder was eventually split into Saxe-Lauenburg and Saxe-Wittenberg in 1296, the latter raised to the status of Electorate in 1356, which became independent as the Kingdom of Saxony after the disintegration of the Holy Roman Empire. The Luitpolding family, responsible for the defense of the March of Carinthia, rose to the position of Dukes. They were succeeded by a branch of the Liudolfing dynasty and eventually the Welfs, whose struggle with the Hohenstaufen Kings resulted in Bavaria being stripped of Austria (1156), Styria and Tyrol (1180). The reduced territorial duchy was given to the Wittelsbach family. Bavaria remained under the control of the Wittelsbach family until the First World War, although it was repeatedly divided into sub-duchies among branches of the family during the 13th to 15th centuries, re-united under Albert IV, Duke of Bavaria in 1503. In 1623, it was raised to the status of Electorate, and following the disintegration of the Holy Roman Empire it became independent as a Kingdom. The complicated political history of the Holy Roman Empire during Middle Ages led to the division or disestablishemt of most early medieval duchies. Frederick Barbarossa in 1180 abolished the system of stem duchies in favour of more numerous territorial duchies. The duchy of Bavaria is the only stem duchy that made the transition to territorial duchy, eventually emerging as the Free State of Bavaria within modern Germany. Some of the other stem duchies emerged as divisions of the Holy Roman Empire; thus, the Electorate of Saxony, while not directly continuing the duchy of Saxony, gives rise to the modern state of Saxony. The duchies of Franconia and Swabia, on the other hand, disintegrated and correspond only vaguely to the contemporary regions of Swabia and Franconia. The Merovingian duchy of Thuringia did not become a stem duchy of the Holy Roman Empire but was demoted to landgraviate within Saxony in 908, and the modern state of Thuringia was established in 1920. 1 2 See Donald C. Jackman, The Konradiner: A Study in Genealogical Methodology, 1990, p. 87, citing Hans-Werner Guetz, "Dux" und "Ducatus." Begriffs- und verfassungsgeschichtliche Untersuchungen zur Enstehung des sogenannten "jüngeren Stammesherzogtums" an der Wende vom neunten zum zehnten Jahrhundert, 1977. ↑ "Germany consisted in 911 of the five tribal, or, as the Germans call them, 'stem' (Stamm), duchies of Saxony, Franconia, Bavaria, Swabia, and Lorraine. [...] The people of the various 'stem' duchies showed characteristic traits also in culture and language. And though the tribal duchies had lost their political role in German history by the thirteenth century and had been replaced by other and usually smaller regional units, their tribal dialects and folklore have survived to the present day and even now act as strong forces toward cultural diversity. In this respect, 'Teutonic' Germany has had a thousand years of historical unity." Hajo Holborn, A History of Modern Germany: The Reformation, 1982, p. 4. ↑ The High German consonant shift at this time was in its final phase, and would generate the so-called Rhenish fan of Franconian dialectal division and the division into Upper German, Central German and Low German in conventional use for modern German dialects. A Thuringian dialect is not indicated as there is no documentary evidence for a separate Thuringian variant of Old High German (Thuringia is subsumed under Old Frankish in the map). It should be noted that the division of Old High German into Alemannic and Bavarian is also conventional, as clear dialectal features dividing the two branches emerge only in the Middle High German period. ↑ Hans-Werner Goetz: Die „Deutschen Stämme“ als Forschungsproblem. In: Heinrich Beck, Dieter Geuenich, Heiko Steuer, Dietrich Hakelberg (ed. ): Zur Geschichte der Gleichung „germanisch-deutsch“. Walter de Gruyter, Berlin 2004, pp. 229–253 (p. 247). ↑ Carl Erdmann: Der Name Deutsch. In: Karl der Große oder Charlemagne? Acht Antworten deutscher Geschichtsforscher. Berlin 1935, S. 94–105. Hans Kurt Schulze: Grundstrukturen der Verfassung im Mittelalter. Band 1: Stamm, Gefolgschaft, Lehenswesen, Grundherrschaft. Urban-Taschenbuch, Stuttgart 1985, p. 37. Hans-Werner Goetz: Die „Deutschen Stämme“ als Forschungsproblem. In: Heinrich Beck, Dieter Geuenich, Heiko Steuer, Dietrich Hakelberg (ed. ): Zur Geschichte der Gleichung „germanisch-deutsch“. Walter de Gruyter, Berlin 2004, 229–253 (p. 238). 1 2 3 Reynolds, Kingdoms and Communities, pp. 290–91. 1 2 Patrick J. Geary, Phantoms of Remembrance: Memory and Oblivion at the End of the First Millennium (Princeont, NJ: Princeton University Press, 1994), p. 44. ↑ Herwig Wolfram, "The Shaping of the Early Medieval Principality as a Type of Non-royal Rulership", Viator, 2 (1971), p. 41. ↑ This thesis was popularised for English scholars by Geoffrey Barraclough, The Origins of Modern Germany, 2nd ed. (New York: 1947). ↑ That he claimed the whole, and not just Bavaria, has been doubted by Geary, Phantoms of Remembrance, p. 44. ↑ James Westfall Thompson, "German Feudalism", The American Historical Review, 28, 3 (1923), p. 454.